Is War Really a Priority? Why are we paying for war? The British establishment is paranoid, and like all former superpowers, no longer knows its place in a changing multi-polar world. It strives to preserve the myth of its own global relevance, spearheading military action blindly and capriciously against perceived enemies whilst simultaenously imposing austerity upon its own most vulnerable.The very same Conservative government which ideologically oppposes government funding to those in need of welfare, which privatises state assets to their Etonian friends for fractions of their potential worth. Rejecting state intervention in the markets means nothing when the collusion between military contractors and the government is taken into consideration. Our government has no qualms about subsidising the arms industry, notable contractors such BAE systems benefit significantly from this system of upper-class patronage. The logic of our government, who may or may not be acting solely in their vested interests must also be called into question regarding Trident. 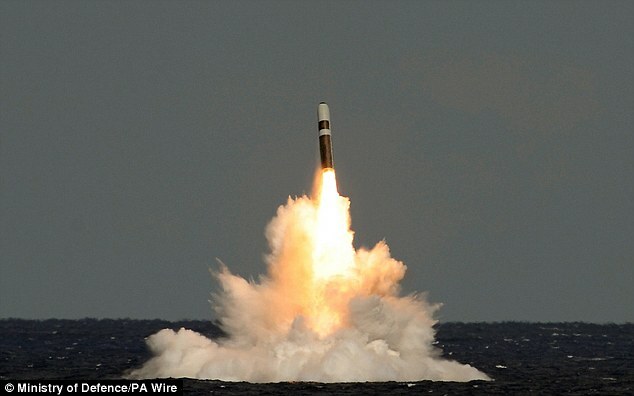 Why is the £100 billion pounds used to re-comission the Trident nuclear weapon system,(which is useless as the main threat to Britain is domestic terrorism and cyber-hacking) seen as a more worthwhile investment than an improved public National Health Service free at the point of use or renewed governmental investment in affordable housing or even an end to tuition fees? When does war ever return a profit for humanity? The money wasted is so great and the potential for re-affirming social justice is gigantic that it simply proves the detachment of our elitist government from the best interests of democracy and the people. Peace is antithetical to our governmental policy of perpetual war, neither major party voted against the aerial bombing campaign against Islamic State, echoing the illegitimate invasion of Iraq, which was similarly voted through unopposed and led to the deaths of between ‘151,000 to over one million’ just during the invasion. Not even considering the moral and economic implications of such a vast militaristic effort for the British and American taxpayer; what of international law? What has been forgotten by our leaders is the significance of international military aggression; an act described as ‘not only an international crime,’ but as ‘the supreme international crime differing only from other war crimes in that it contains within itself the accumulated evil of the whole.‘ as described as in the Nuremberg trials against the Nazis. We must be vigilant and resist attempts by our government, who use the corporate media to control what we see and hear, with the aim of establishing and legitimising new wars with a new enemy. The campaign of vilification against Vladimir Putin is unjustified and motivated entirely by a thirst for conflict by the West. The very same military contractors and arms manufacturers that showcase their weapons of mass murder at the ExCeL Arms Fair benefit from the propaganda we hear against Eastern Ukraine and Russia. Both of which, are far from liberal social democratic utopias, but refuse to bend to the economic imperialism of America and Britain. The democratic referendum in Crimea was an exercise of its national right to self-determination, yet the media was quick to dub this democratic decision as an ‘annexation’, through Orwellian means it is clear that the truth itself can be manipulated by a corrupt media. This Post was posted in Post - Opinion. Bookmark the permalink. Thanks for reading guys! ^_^ — BTW Check out – http://www.medialens.org/ it’s a brilliant organisation that scrutinises the media, in its entirety, even the so-called liberal media of the Guardian and the Independent, that is so quick to back war. Also – http://www.stopwar.org.uk/ – The stop the war coalition led a valiant attempt to stop the Iraq War and continues to be at the forefront of campaigns for peace in the U.K. If you feel like trusting politicians, the Green Party has rather progressive policies regarding Trident and Education AND lastly – Russell Brand’s ‘Trews’ are a great perspective. Imperialist British, bombing our brothers at home who are fighting the good fight.